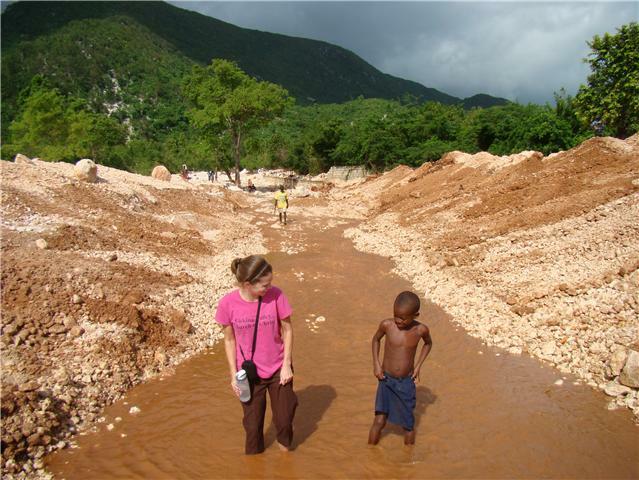 Last week in Haiti has been quite the variety of situations. I worked with an American team (well I took pics they worked) putting on 1.5 roofs on dorms at the church camp HCO is building in Peredo. It was hot, but Americans and Haitians alike were eager to work. They did a great job improvising and using available tools and equipment. Sometimes the generator didn’t work for the power tools, sometimes the measurements were off, but the whole time 2 groups of people from very different cultures worked together. I love watching people work together, trying to accomplish the same goal using different languages and different methods. Somehow it works out. I met the kids at the school in Peredo this week. There are 57 students who meet in the church building for school. Right now there is preschool, kindergarten and 1st grade. I played with them, helped serve lunch and by the end of the week I wasn’t just the “blan” (white person) but “Miss Ginny.” I think I was their entertainment as I practiced my Creole with them. By the sounds of their laughter I am sure I was. The kids all meet in the same one room building. The chalkboards separate the classes. They sit in folding metal chairs all day. Lunch time is a treat for them. They each get a bowl of rice and beans or rice with a soy, protein supplement. They scraped the bowls clean! Then it is rest time-some fall asleep sitting up in their folding chairs. On Saturday there were some people who came to the HCO clinic in Port-au Prince to start planning a surgical center for children there. They have some big plans! Please pray for this project as it would help hundreds of kids with Hydrocephalus (“water on the brain”) and cleft lips/palates. The Project also would provide a neurosurgical residency for Haitian doctors which is much needed here! Exciting things are happening in Haiti. Saturday night I went with the Short term group to see a dance/theatre put on by former Haitian Street Boys. There is a mission here that started that program over 20 yrs ago and they take in orphaned street boys and raise and educate them. They also teach them dance and do a show for visitors to raise money. It was a great time. They have danced in New York, Chicago, Canada and other places outside of Haiti. Listening to some of their life stories I was reminded how God loves each of us and never forgets us! Some of the boys had been slaves as children here in Haiti. I could see the thankfulness for opportunity in the boys dance. Psalm 149:3 says, “They should praise Him with dancing. They should sing praises to Him with tambourines and harps.”-NCV. And praise Him they did! I can’t imagine a life where people would avoid eye contact with me, cross to the other side of the street to avoid me and then to have people coming to pay to watch me perform. The boys talked about how it improved their self esteem. So there are some of the random events from last week. I need to go study my Creole more-those are instructions straight from my teacher-so that’ll tell you how school is going. Looks like another busy week Ginny. Nice job with the pictures. Well our January thaw is a little late, but we are going to take it. By the time Sunday rolls around, all of the ice will be a memory. By the time Thursday rolls around, we'll be talking flooding. Funny how we go from winter to flooding in less than a week. Miss Ohio yet? Play Ball!!! Well the Ginnyisms are blowing up. I didnt have to come up with one on my own this week, I have people requesting that I post them. This weeks 3rd edition of the Ginnyism comes from Jason T. "Is it me, or is it loud in here?" If you want to be a part of the 4th edition, feel free to let me know. We have plenty of installments reamining until Ginny comes home. Sorry that was the 4th edition. Hopefully, Ginny caught that. The weeks are flying by.